According to the Economic Policy Institute (EPI), the U.S. economy needs to create a minimum of 127,000 each month in order to keep pace with population growth. And based on today’s Employment Situation Report, the economy created just 80,000 jobs in June. That means the jobs deficit increased by another 47,000 last month. Yet, according to Barack Obama, “That’s a step in the right direction.” However, according to economic common sense, it’s another step towards stagnation, then decay and dissolution. He added, “We can’t be satisfied because our goal was never to just keep on working to get back to where we were back in 2007.” So according to Obama, his goal was never to just keep working to get back to where we were in 2007, a day when we had 4,805,000 jobs more than we have currently. “I want to get back to a time when middle-class families and those working to get into the middle class have some basic security,” he said. We are left to wonder what time that was – the 1920’s, 50’s, 60’s, 80’s, 90’s, or the 2000’s. But based on the latest jobs report, that time could have been any year prior to Obama’s term. As you can see graphically in the chart above, the jobs deficit has little changed since left-wing Economist Paul Krugman’s December of 2009 assessment. According to Krugman, to be meaningful, the economy needed to add 300,000 jobs a month, from the end of Obama’s 11th month in office, through December of 2014. 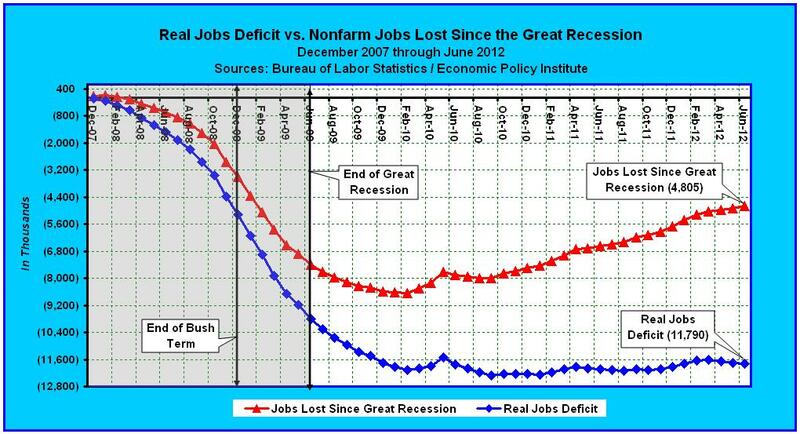 But since then, as shown in the corresponding table, the jobs deficit hasn’t decreased at all. Last month, according to the Bureau of Labor Statistics, the U.S. economy created a mere 80,000 jobs, on top of a revised 78,000 in May, and 68,000 in April. But the economy needs to create 127,000 jobs a month just to keep pace with population growth. So that means we’ve fallen 156,000 jobs farther behind over the last quarter. In fact, at last quarter’s pace, the U.S. will find itself another 3,120,000 jobs in arrears in another 5 years (156,000 jobs * 20 quarters). We know that any result short of a 127,000 monthly increase in Nonfarm payroll jobs adds to the current jobs deficit, but we should be mindful of an even more important statistic: The number of jobs we need to create each and every month, in order to catch up. In order to keep up with population growth, we would need to create 127,000 jobs times 30 months, or 3,810,000. Add in the need to make up for lost ground and we’re at around 15,600,000 (3,810,000 + 11,790,000) over the next 30 months — or 520,000 jobs a month. In order to keep up with population growth, we would need to create 127,000 jobs times 60 months, or 7,620,000. Add in the need to make up for lost ground and we’re at around 19,410,000 (7,620,000 + 11,790,000) over the next 60 months — or 323,500 jobs a month. In other words, we aren’t moving in the right direction, we’re going in circles. Since the economy now needs to create 520,000 each and every month to be on a track towards full employment within 2 ½ years, or 323,500 jobs each and every month to be on track towards full employment within 5 years, Obama’s record of 80,000 jobs in June has only pushed us farther away from the mark. In fact, as I alluded to above, instead of heading towards full-employment, we are currently on track towards increasing the jobs deficit by another 3,120,000 jobs over the next 5 years. The Bottom Line: As each month passes in which fewer than 127,000 jobs are created, the goal of full employment is pushed farther away. When Barack Obama was sworn into office, the U.S. was running at a deficit of 5,165,000 jobs, but since then the deficit has increased by an additional 6,625,000 jobs (see table). So we are NOT moving in the right direction, no matter what Barack Obama thinks. 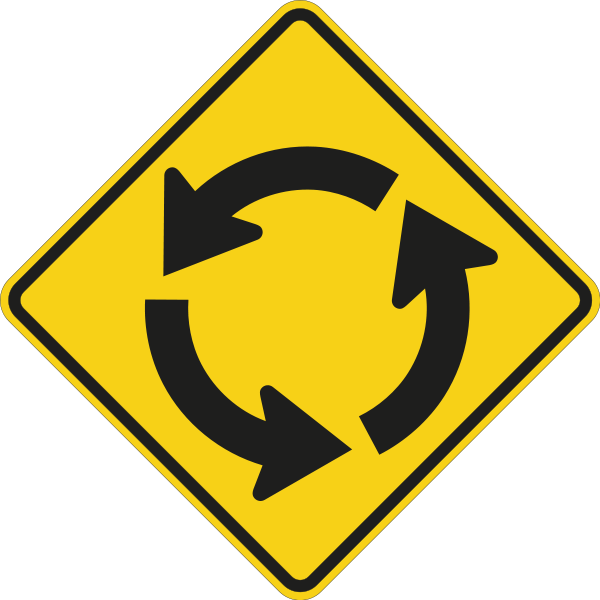 We’re just going around in circles. The Spiritual Principle behind Step One in any recovery program is Honesty. When Barack Obama says we are moving in the right direction, he’s not being honest with himself, or with the American people. Photo Credit: Mr. Barlow’s Blog – Are you going round in circles?